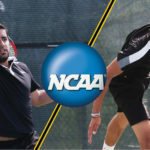 Gustavus Adolphus College men's tennis players Andres Saenz (Sr., Cancun, Mexico) and Mohanad Alhouni (So., Tripoli, Libya) suffered a pair of losses Thursday in the 2016 NCAA Individual Championships that were played at Stowe Stadium at Kalamazoo College. In doubles, Saenz and Alhouni were defeated by Scott Rubinstein and James Spaulding of Emory University 6-2, 6-1, and in singles, Alhouni fell to Steven Chen of Wesleyan College by a 6-4, 6-0 count. UPDATE (2:32 p.m. May 25): The singles and doubles draws have been released. Mohanad Alhouni will face Steven Chen of Wesleyan (CT) at 9 a.m. Thursday in the singles draw, and Alhouni and Andres Saenz will face Scott Rubenstein and James Spaulding of Emory at 3 p.m. Thursday in the doubles draw. 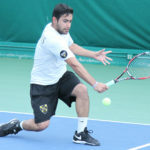 The Gustavus Adolphus College men’s tennis team concluded its 2015-16 season Sunday, suffering a 5-2 loss to No. 8-ranked University of Chicago in the third round of the NCAA Championships played at the Stagg Field Tennis Courts. The Gusties earned two out of three doubles matches before the Maroons were able to win four straight points in singles to clinch the match. This marks the second consecutive year that Chicago has eliminated Gustavus from postseason play. The Gustavus Adolphus College men's tennis team earned a 5-2 victory over No. 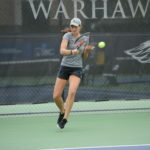 34 Coe College in the second round of the NCAA Championships that was played Saturday afternoon at the Stagg Field Tennis Courts on the campus of the University of Chicago. With the win, the Gusties improve to 24-7 overall and advance to tomorrow's regional final that will be played at noon against the winner of No. 8 University of Chicago and Carthage College. The Gustavus Adolphus College women's tennis team concluded its 2015-16 season Friday, suffering a 5-2 loss to No. 9-ranked University of Chicago in the second round of the NCAA Championships. The Gusties earned two out of three doubles matches before the Maroons were able to win four straight points in singles to clinch the match. Gustavus finishes its season with an overall record of 22-8, its most wins since the 2010 season. 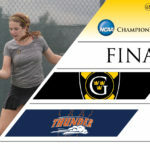 The Gustavus Adolphus College women's tennis team was victorious in its first round of the NCAA Championships, taking a 5-1 victory over Wheaton College at the Wangerin Tennis Courts on the campus of the University of Wisconsin-Whitewater. With the win, the Gusties advance to the second round of the national tournament tomorrow against No. 9 University of Chicago at 1 p.m.
Five Gustavus Adolphus College women's tennis players were named to the All-MIAC Team that was announced Tuesday by the conference office. Seniors Sid Dirks (St. Peter, Minn.) and Lizzy Stanczyk (Plymouth, Wis.), junior Michaela Schulz (Elk River, Minn.), sophomore Ally Baker (Rosemount, Minn.), and first-year Briana Hartmann (Owatonna, Minn.) were each named to both the All-Conference singles and doubles teams. In addition, sophomore Katie Aney (Rochester, Minn.) was named the conference's Elite 22 winner, which honors the individual with the highest GPA at the MIAC Playoff Championship site. Six Gustavus Adolphus College men’s tennis players were named to the All-MIAC Team that was announced Tuesday by the conference office. Senior Andres Saenz (Cancun, Mexico), and sophomores Zach Ekstein (Eagan, Minn.) and Mohanad Alhouni (Tripoli, Libya) were each named to the All-Conference singles and doubles teams, while senior Mitch Elofson (St. Peter, Minn.) and sophomore Gabe Steinwand (Moorhead, Minn.) were named to the singles squad, and sophomore Tommy Entwistle (Sioux Falls, S.D.) was named to the doubles team. 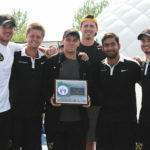 In addition, Coach Tommy Valentini earned the Steve Wilkinson Coach of the Year honor for the third time in his seven seasons at the helm of his alma mater, and Steinwand was named the conference’s Elite 22 winner, which honors the individual with the highest GPA at the MIAC Playoff Championship site. Gustavus Adolphus College men's golfers Andrew Krasaway (Sr., Hermantown, Minn.), Chris Captain (So., Rochester, Minn.), and Max Savini (Fy., Anoka, Minn.) were named to the MIAC's All-Conference Team that was announced Monday by the conference office. 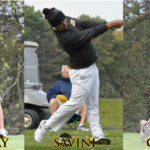 Savini also was named MIAC Freshman of the Year and the ** Region Freshman of the Year. The honor is the second for Captain and the first for Krasaway and Savini. 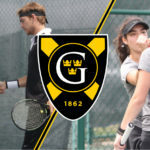 The Gustavus Adolphus College men's and women's tennis teams begin their NCAA Tournament journeys this Thursday and Saturday. The women's team will travel to Whitewater, Wis. for their first round matchup with Wheaton College on Thursday at 4 p.m., while the men will head to Chicago and will play their first match against Coe College on Saturday at 10 a.m.